ERS-106UV system provides safe, pure water using Reverse Osmosis Technology. It is one of the finest units in its class. It uses no chemicals or electricity and provides premium water quality. It's capable of removing over 99% of total dissolved solids, +99% of all organics and +99% of all bacteria. The knack of 1gpm PUREPRO UV system lies in employing the 254nm ultraviolet rays (UV-C) to caused immediate death for organisms or wipe out their ability to survive and reproduce. 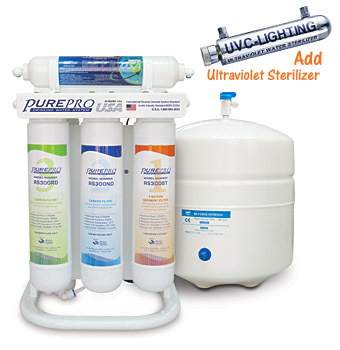 For more information about PureProR Ultraviolet Sterilizer, please click here. With your own R.O. water filter system under your sink working for you twenty-four hours a day, you can have as much purified water at the touch of a finger whenever you want it. Free to use all you want, clean, safe water on tap, and no more trips to the store.